Last night I was watching the Dodgers play the Brewers in Game 4 of the NLCS. In the late innings of the game, the “closer” is brought out to shut down the opposing team’s attempts to score any final runs. I watched the scene carefully – the look in the eyes of this closer, the sweat dripping from his brow, the way he spun the ball in his hand, the buzzing adrenaline of the crowd, the lights glaring down and the intensity of each pitch as it was released. Then, I laughed inside thinking of how fickle people are. If this man performs to their standard they’ll sing his praises, but if he “chokes” the onslaught of their opinions will commence! It amuses me to think of those same people standing on the mound, crowd swelling around them, heart pounding – how loud would their criticism be if the ball was in their hand? Yes, I have found a way to spiritualize baseball – my husband would be proud! 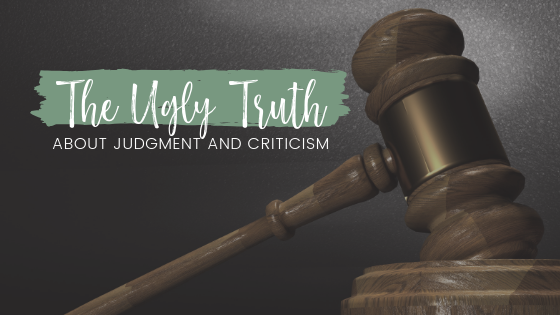 On a serious note though – the Bible has a lot to say about judgment and criticism. I’m not talking about the light sideline sports commentaries, but the appointing of ourselves as judges over the lives of other people. Back to the baseball game – how many of us imagine what it would be like to walk in the shoes of the people we judge and criticize? What if the decisions fell to me? What if the weight of that responsibility were on me? What if that was my precious daughter strung out on drugs? What if that was my husband that cheated and I was suffering the pain of betrayal? What if I grew up in and out of foster care, rejected by my parents? How would I act as an adult if I never had an example to follow? I’m not justifying the foolish decisions people may make, and I’m not absolving accountability, but how many of us say, “I would never…” – “If that were MY child I would…” – “If it were up to ME, I would…” – see, it’s the same spirit of the sideline critic that has all of the opinions and NONE of the experience! Paul was writing to the church at Corinth and letting them know that he served the Lord and answered to Him. It didn’t matter whether they judged him. In fact, he didn’t even trust his own judgments about himself! He made it a point to communicate that God was the only one qualified to be the judge. Why? He is the only one that knows the real deal! What do I mean by that? Outward appearance IS NOT, I repeat – IS NOT – our basis for judging anything! God sees right through all of the outer facade and into the secret motives of the heart! At the appointed time all of those hidden motives will be brought to light. You know what? A lot of us will be surprised by how different God’s judgments are from ours. We might even be shocked to see some people in heaven (BRO!? YOU made it!) – yeah – he did. What!?!?! When you look this up – the idea of measuring – it is the idea of a ruler that one uses as a standard. In other words, when you hold someone to a certain standard, you better be meeting that standard yourself because that is the EXACT standard that YOU will be judged by. Suddenly I’m feeling a little more merciful! Think about this! Really think about it! When I blurt out my opinions about how to run the church or the company, or how to parent, or how someone should get their act together, God will pull out a sheet with MY WORDS on it and hold it up as He judges the way I ran my life, and how much I had my act together! Wow! What a renovation our lives would experience if we stopped judging others and started judging ourselves! How merciful we would be! How compassionate! How great our love walk would grow! As soon as we began opening our mouths to criticize we would instead look into our own heart and judge where we may be coming short. Again, I am not implying that we never hold a person accountable for their actions, or there is never a case for confronting sin, but I AM saying that there are a whole lot of things that are just none of our business, and the world will keep spinning without all of our poignant observations. Oh, that we would learn this! So what is a Christian to do!? Pray, honey! Ask God to help you set a watch over your mouth and guard the door of your lips. Every now and then sneak up behind yourself and listen to yourself talk. Then ask yourself, “Why am I saying this? Why am I bringing this up?” Is it pride? Is it comparison? Is it rebellion? Is it frustration that should be laid before God instead of presented to a man or woman? And finally, listen to this age-old advice, “If you don’t have anything nice to say…” – you know. I’m on the journey with you. Let’s get this ugly judgment and criticism out of our lives so love and joy can reign supreme in our hearts. One day when we stand before God we will be thankful that we grew in mercy, love, and compassion. So be it!